The director of marketing at a local museum needed to refresh a series of exhibits and had very specific requirements. 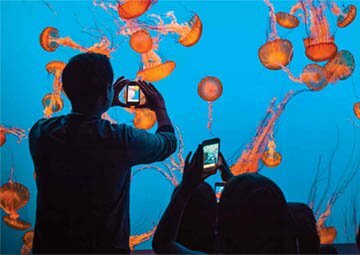 Unlike most museums, this particular museum encouraged flash photography and visitor engagement with each exhibit. 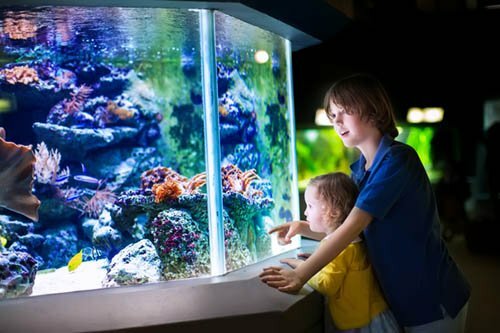 The exhibits were created for children to help them understand marine wildlife. The museum needed each graphic recreated with the precise color match to the original. Most importantly, the new material needed to not have a glare created by flash photography so that pictures of the museum’s exhibits weren’t washed out. Rather than produce the wall graphics on vinyl or laminate, we chose a dense, adhesive fabric that could be removed and repositioned. The exhibit installers really liked how forgiving the cloth material was, especially when they were covering a large area. The fabric was flooded in the same rich, vibrant colors as the original artwork. It was an identical color match to the original, even as it was stretched and put into place. As the exhibit was being constructed and the fabric was being positioned, we ran several test photos with flash and got no flashback. The vivid colors of the exhibit came through in the photos and showed the quality of the museum. During the launch of the new exhibits, the museum had one of the best social media presence experiences it had ever had. Parents brought their children into the museum and were being encouraged to take photos at each exhibit and share them on social channels. Through the network of schools, teachers, and parents, word of mouth was very powerful and pivotal in the success of this exhibit. Visitor ticket sales spiked and it was a record-breaking weekend for children’s ticket sales.